Debate: Are intervals a frustrating distraction from the drama or a valuable break to gather thoughts? Which works do you think could do with an interval tweak? It’s a convention of theatre-going that most productions offer an interval break – a chance for the audience to stretch their legs, grab a drink or snack, or head to the loo. But in opera, a handful of composers have eschewed intervals in favour of unbroken drama. Richard Strauss’s Salome and Elektra, Berg’s Wozzeck, and Bartók’s Duke Bluebeard’s Castle are all masterpieces that benefit from the intensity of an interval-free experience, as we follow the character from rise to terrible fall without remission. What about Der fliegende Holländer, currently on stage at Covent Garden? Today the opera is commonly performed without break – another crucible for characters and audiences. But that wasn’t the case in Wagner’s time. The intervals were first removed only in 1901, when for a production at Bayreuth Wagner’s widow Cosima decided to return to what she understood as Wagner’s ‘original conception’. Are we right to follow suit? Or is Cosima’s alteration artificial and needlessly-taxing? Say you do have intervals – should it be one or two? Probably the most common opera structure is in three acts, so two intervals – but does this make the whole show too long? Or does it help to have these points of reflection? Does La traviata need two intervals, or is it better with one or none at all? The crucial thing is that intervals completely alter the pace, and therefore experience, of a work. Choreographer Christopher Wheeldon rethought the structure for his 2011 ballet Alice’s Adventures in Wonderland, and introduced a second interval for its first revival in 2012. For most it was a good move, lightening the first act and making the ballet more accessible for a young audience. And all this is before you even get to the challenges of a ballet mixed programme – having a 30-minute interval between each work can sometimes mean you get more interval than ballet in your evening. Perhaps, though, it is the case that we need to take a break between works that are often very different. @RoyalOperaHouse Don't make me sit for longer than 90 mins without a break. Ideally every hour. Don't care what the composer wanted. @RoyalOperaHouse Adds to the drama and suspense. Helps concentration. Don't waste it with queues and idle chatter. @HumphreyBohun @tomoxenham @amwilson_opera @RoyalOperaHouse Don't mind an intervalless Rheingold. But yes. Definitely in Holländer. @RoyalOperaHouse Could lose 2nd interval in Swan Lake & have pause between acts 3 and 4 in the same way as between 1 and 2? 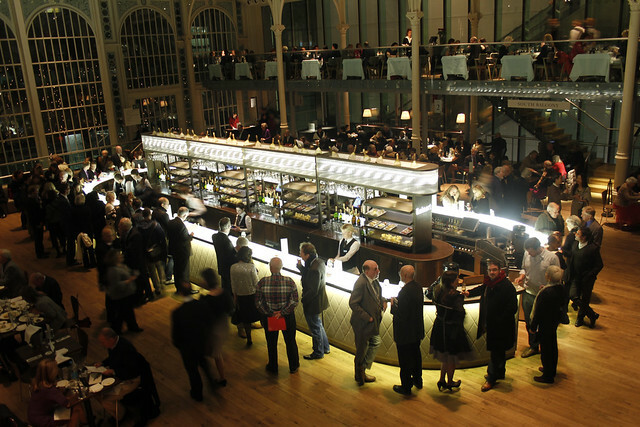 @royaloperahouse Your intervals are too long at (min) 30 mins - more about maximising your catering concessions than anything else. Are intervals a frustrating distraction from the drama or a valuable break to gather thoughts? Are there circumstances in which we can change a composer or choreographer's structure? Which works do you think need interval tweaks? The production is given with generous philanthropic support from Marina Hobson OBE and the Wagner Production Syndicate. This debate will result in as many different opinions as asking whether opera should be staged traditionally or updated. We all have completely different views and you won't win. Personally, 30 mins is just fine if we are meeting friends for a drink but too long if we are on are own and just need a "loo" break. See what I mean? Don't like intervals at all and rarely leave the auditorium unless I am with someone who wants to have a drink/ loo break. And I get fed up with getting up and down from my seat to let a seemingly constant stream of people making their way in and out of their seats. Personally I would ban intervals,except for those that are essential for set changes. After all,to get from the stalls circle or stalls to the bar takes such an age that there is no chance to do anything but.. grab your pre ordered drink,gulp it down and fight your way back to your seat. Prefer leisurely drink beforehand. And long intervals in ballets like Giselle or Fille are just a means of making a long evening out of what are very short ballets. Many cinema films are over two hours long and nobody demands an interval. Obviously it depends on the work, but for my sake you could consider performing any opera up to 160 minutes without an interval. I suppose that would include Boheme and Tosca and some bel canto pieces. I believe I saw Traviata with Christine Schäffer at the Statsoper in Berlin without an interval once; a much more intense experience if my memory serves me right. After all, we often listen to opera recordings without a break. An added bonus would be earlier curtain times! Most of the time too long. I have attended ballets when the intervals are nearly as long as the ballet itself. Going to the opera house shouldn't be an endurance test. I like a couple of intervals, though it would be better if the second interval was half the length for comfort break purposes only. I always feel that while inside the luxurious surroundings of the opera house the outside world ceases to exist in a way so you never quite leave the imaginative world of opera even if there is a break in the drama. Have noticed that a lot of people seem to use intervals as an opportunity to "seat hop"..
For some shorter works it is probably preferable, like Elektra, which also has an intense musical continuity anyway. But it is a natural and relaxing break to stop for 20 mins or so between acts in most Operas and the composers were well aware that's what would happen. And who needs to pay the best part of £200 to end up crossing their legs and dying to go to the loo waiting for the opera to end. I would see any move to pin me in my seat without a break as a cynical move to us clear us out in a shorter time and save the bother of providing interval facilities. After all, those who don't want to be refreshed can stay put and wait for the scenery to be changed in their seats. I would not attend if there were no intervals. Not only do I need to get up and move about a bit - I find most of the seating uncomfortable for long periods of time and my back seizes up - but a bio break or the opportunity can be essential. I don't find intervals 'break' the spell or mood at all and have always assumed that it helps the performers as much as the audience. There are quite a lot of seats at the cheaper end of the range that have limited leg room or are not well cushioned. Sitting for a very long time is not comfortable. I see no reason why natural pauses in a piece such as the end of an act should not have an interval either after each act or in the middle if it is a 4 acter. 90 minutes is as long as I feel comfortable sitting, unless it is Wagner, which you just have to accept. Running a piece for 2 or 2 and a half hours without an interval is ridiculous and I wish this fad would end. I can get engrossed in something but when my bum hurts, my interest gradually wanes until all I am thinking about is how I want it to end. Also, if I am with friends I want time to discuss what is going on. I agree with the comment about ballet. I don't mind if it's for a big set change but often with a mixed programme there is as much interval as ballet. It sometimes feels like the interval time is being used to 'pad out' an evening. I'd prefer shorter intervals and an earlier finish where possible as I have a 2 hour commute. The composers and choreographers know full well when the performers need a break to be able to give of their best! NOT for directors to go inserting extra intervals! 30 minutes DOES seem a reasonable length for one if people like the idea of scrummaging at a bar or getting some sensible movement after an hour in the same spot! Two and a half hours passed all too quickly last night. Any interval would have destroyed the psychological darkness so skilfully built up as the opera progressed. And an added bonus for us cinema-viewers? We didn't have to endure inane tweets from audience members all over the world, nor lightweight "question and answer session" with members of the cast. Sitting in the auditorium or on a bench seat for too long is not a pleasant experience so definitely in favour of intervals. However not sure of the need for 30 mins. Would love the first act of barbiere to be split up with an interval! Why not put it to the test ? Split a run into performances with and without interval and see which sells better ! The older I get the more I need to get to the loo after a couple of hours. In a movie there is no problem with exiting and, more importantly, returning to your seat after a comfort break. Wouldn't work in the middle of the amphitheatre, would it? I think about 75 minutes should be the maximum period without a break. Salome and Rheingold should have an interval - I agree with one of the contributers who said that it doesn't matter what the composer or librettist intended - they are not Gods- just talented musicians /playwrights and if things work well with a bit of tweaking so much the better. Nothing should be set in stone !! I am sorry Iain but your comments about having an interval in Salome or Rheingold just do not make sense. There is no logical musical break in either of these pieces and the composers deliberately set them that way. and I strongly believe that the composers' views should be respected and adhered to. I understand that in some of the earlier performances of Rheingold that someone did try to put an interval during the descent to Nibelheim between scenes 2 and 3 but this did not make sense. Whether it ever happened at Covent Garden I am not sure, but may be an archivist could confirm this. Good luck finding anyone to perform Traviata, Carmen, Tristan, Boheme or any other 2+ hour’s without a break! It’s just too tiring for the performers! It's an interesting idea concerning an interval-less opera. Personally, I have not seen many operas and The Flying Dutchman is one I would LOVE to see done live. In my opinion, the whole point of an interval is not so people can take a break to go to the loo or have a drink to talk about the show but rather because there is a natural pause in the text that makes it suitable to have time to return back to reality and review how the show is going. However, I will say that it should not be the case of not having an interval for the sake of the drama as sometimes it can be too intense and you do need some time to relax from what you have witnessed. Now yes, knowing a little bit about Wagner, his other operas are longer (Including The Ring Cycle in which each opera lasts between 3-4 hours long). But if you are going to have an interval, do it where you think there is that gap not only to get out of the drama but also to be eased into the drama. Intervals are not meant to be comfort breaks but more a time to break away from the action because there is a natural pause in the text. As for whether people should stick to the composers, personally, unless the composer says in a set of accompanying notes justifying why there should not be one, I would stick to the word of the composer because he knows why even if you can't work it yourself. However, his notes are not compulsory sometimes and it would be interesting to see both an interval-less and interval version of Flying Dutchman and see what the experience is like observing the two as it may be that an interval in this particular opera would not work as well as it may be intended.